Home »Uncategorized»Outlook Hangs on IMAP Server Test! Outlook Hangs on IMAP Server Test! How many websites did you search this topic for before you landed here! I have spent many hours in attempt to setup IMAP accounts in Outlook, and it will hang and crash when testing the IMAP connection. Since the release of Office 2013 & 2016 Suites, you can no longer bypass the function to test the IMAP connection. If you are experiencing this problem you are not alone here! 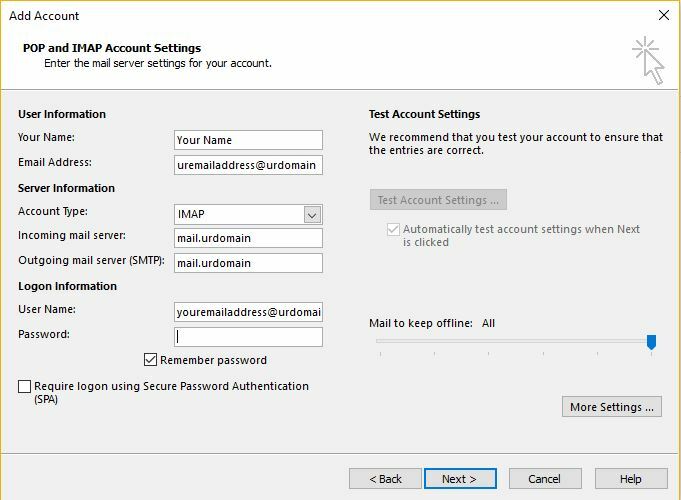 I have a simple solution that I stumbled across when entering the Incoming and Outgoing server for your IMAP account. In order to resolve the problem; in the Incoming Mail field enter instead of mail.yourmailserver enter youremailaddress@yourdomain.com and repeat the same process for the outgoing server. Sounds like a strange idea, but strangely enough it works! Now when you click next ” YES ” it will fail, simply close the failed test then re-enter the correct details for your incoming and outgoing server settings and test again… BAM it works! Of course you will need to make sure all your server settings are correctly entered (eg, port numbers etc…) Hope this helps everyone out their searching for this topic! Some Screen for reference. Please If you took the time to read this and it helped, take the time to comment and review! If you found this little piece of the Internet helpful, please leave a comment! ← Previous Previous post: Welcome to a new beginning! Next → Next post: Microsoft Forms – Office 365 for Business Education – HOW TO?